Posted on January 22, 2009 at 17:04. 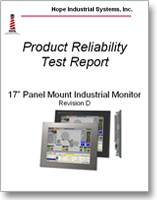 For the first time, Hope Industrial Systems is publishing public versions of many of our internal product reliability test reports on our web site. In the past, we made some of this information available only upon request. The test results shown in these reports simulate the kinds of environments found in process and factory floor locations, as well as the kind of conditions encountered when equipment is being transported and kept in storage. 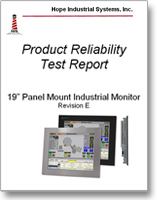 Complete test reports for our Panel Mount Monitors are available on our IEC Reliability Standards page.